Tim and I were talking the other day about our recent coastal habit. It occurred to us that we’ve spent more time near the ocean in the last six months, than we have in our entire lives. Since arriving in Gulf Shores, Alabama sometime in the middle of November, our route has taken us all the way down the Gulf Coast of Florida, around the tip, and back up the Atlantic shore. As we slowly make our way north this summer the trend will continue, and by the time we reach Maine we will be able to claim that we visited the vast majority of the entire Atlantic Coast. Vey cool. Last week we added another section of coastline with a week long stay on the Outer Banks of North Carolina. 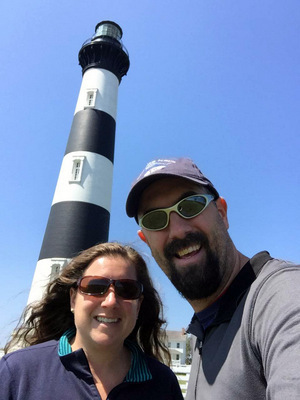 It was our first visit to the Outer Banks, and we were excited to get to know this narrow strip of land famed for its beautiful beaches and impressive lighthouses. Our journey began with a ferry ride. 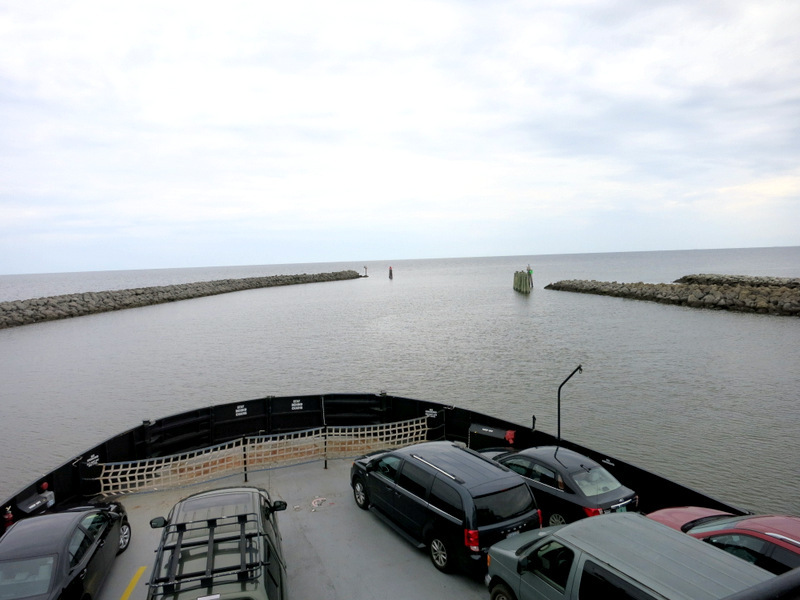 Coming from the south as we did, the only way to get to the Outer Banks is by taking a ferry across Pamlico Sound. We like ferries. I can’t pinpoint exactly what it so appealing about them, but there’s definitely something exciting about loading our home on a big boat and traveling across the water. 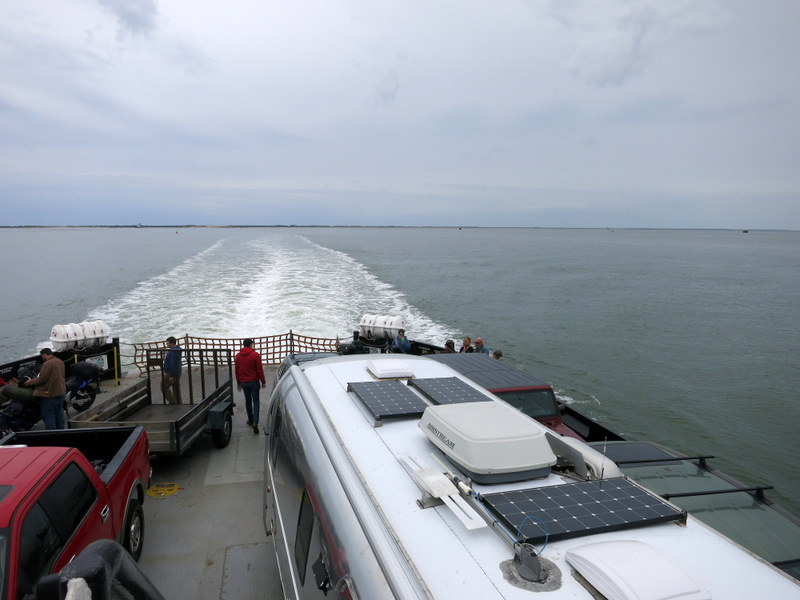 The ferry from Cedar Island to Ocracoke takes about 2 hours. For a vehicle our size (truck + trailer = 45 feet) the ride cost $45. We made a reservations ahead of time to ensure there would be space. It was probably a good idea since the ferry was completely full. It only runs three times a day this time of year, and if we hadn’t gotten on we would have been waiting around until 4pm for the next one. I was excited for the ride, and envisioned spending the whole two hours hanging out on the upper deck watching the scenery pass by and scanning the surf for dolphins. Unfortunately, it was COLD and I only lasted outside for about 15 minutes. Instead, we spent most of the trip inside the Airstream. I read while Tim took a little nap. We couldn’t help but feel a little smug about having a cozy home on wheels while everyone else huddled in their cars to escape the wind. The trip flew by and soon we were pulling into the tiny town of Ocracoke. After securing a parking spot in the nearby Hatteras National Seashore parking lot we unloaded the bikes and headed off for a mini tour of the island. It’s still off-season, but despite the chilling bite in the air, there were a surprising amount of people out and about. 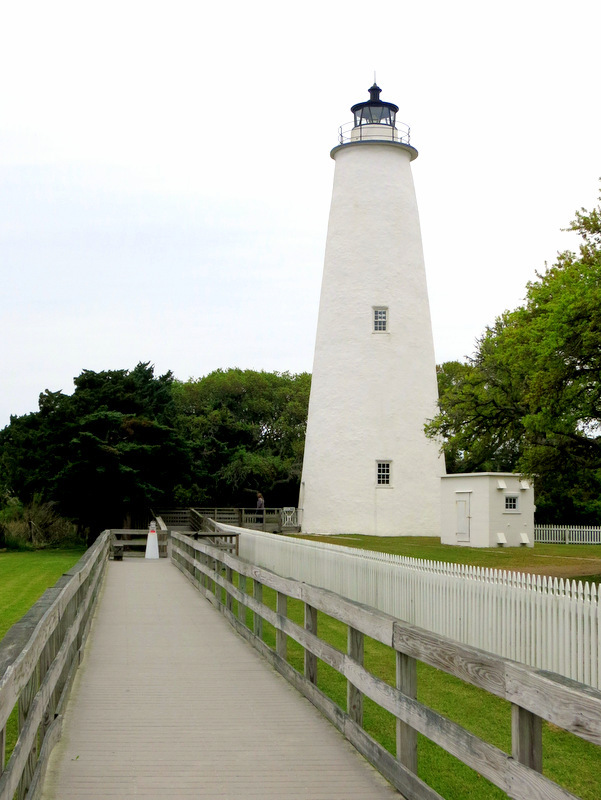 We zipped past weathered rental cottages and tiny tourist shops selling island themed wares on the way to our intended destination — the Ocracoke Lighthouse. As far as the Outer Banks lighthouses go, standing at a mere 65 feet tall, this one is certainly not the most impressive. But it is North Carolina’s oldest operational lighthouse. Unfortunately, the lighthouse is not open for climbing so we had to satisfy ourselves with a view of the outside. 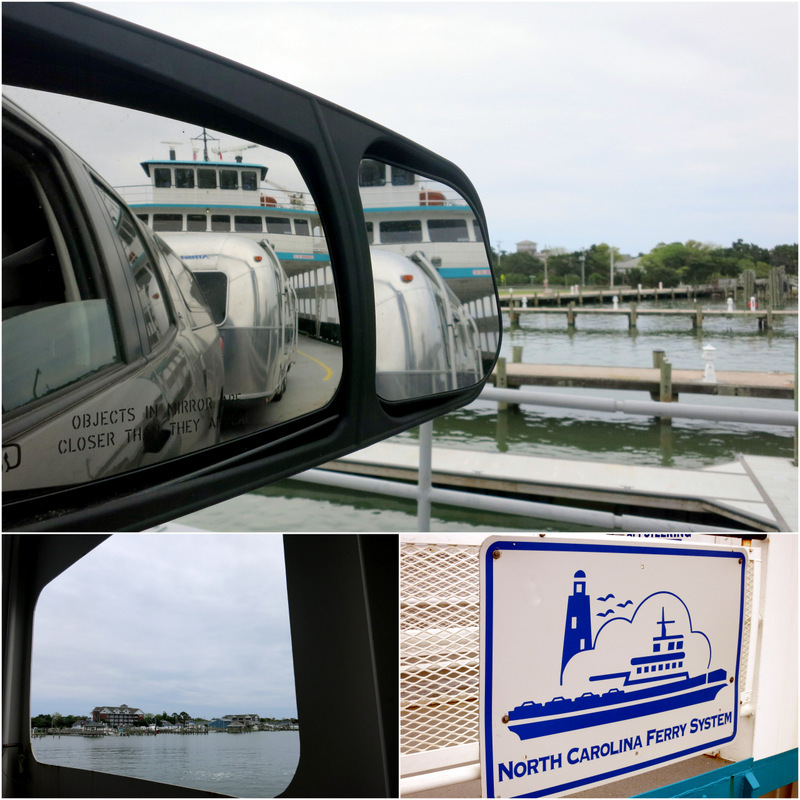 After a quick spin through town we made our way back to the Airstream and headed north to the next ferry. We drove through several miles of road flanked by high dunes on either side. 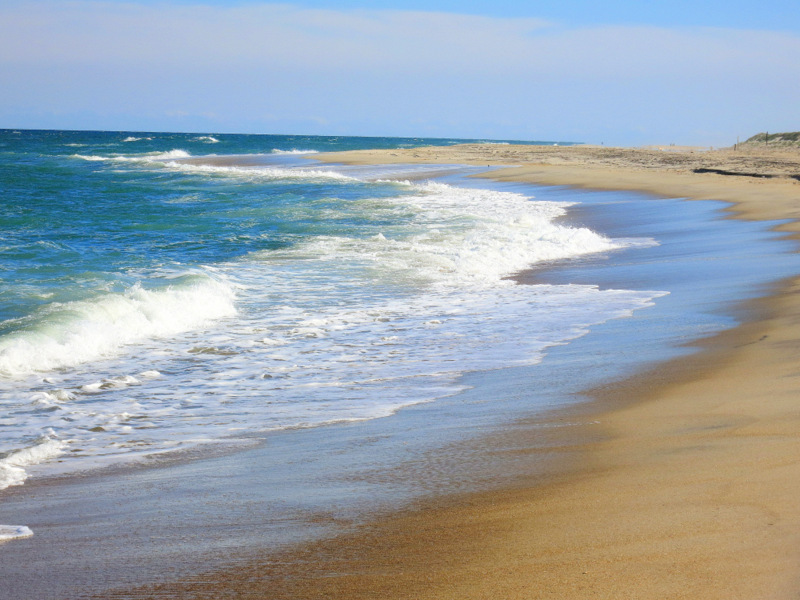 A large portion of the Outer Banks is designated as the Cape Hatteras National Seashore which has ensured that the land stays undeveloped and preserved. 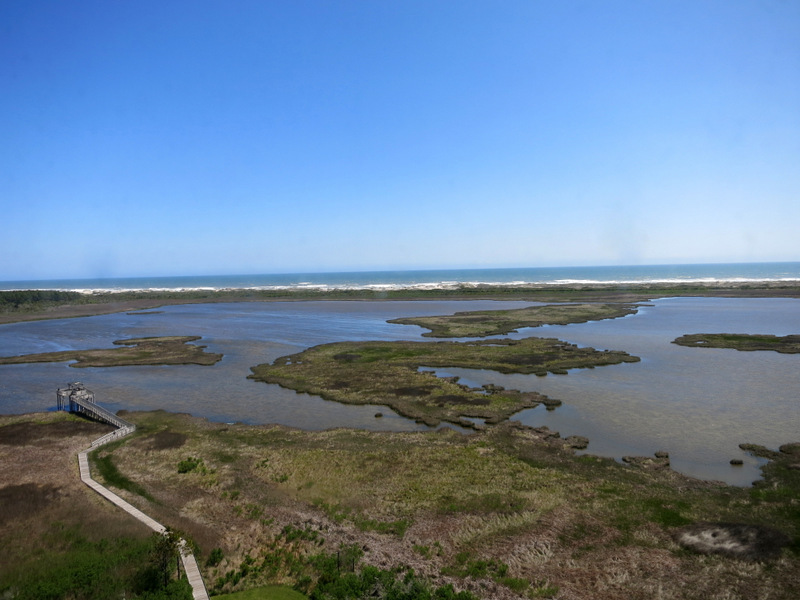 At the end of Ocracoke Island there is an inlet you must cross to reach Hatteras island. It’s not a terribly long inlet, but apparently it’s cheaper to run a ferry than build a bridge, so ferry it so. No problem. We like ferries. Also this ferry is free! We like free. The ferry runs approximately every half hour, and depending on where the shallow sand bars have decided to drift on any given day it can take 30 minutes to an hour to cross. Our route took us far out into the bay and snaked through a maze of channel markers before heading back toward land. Total ride time was about 45 minutes. 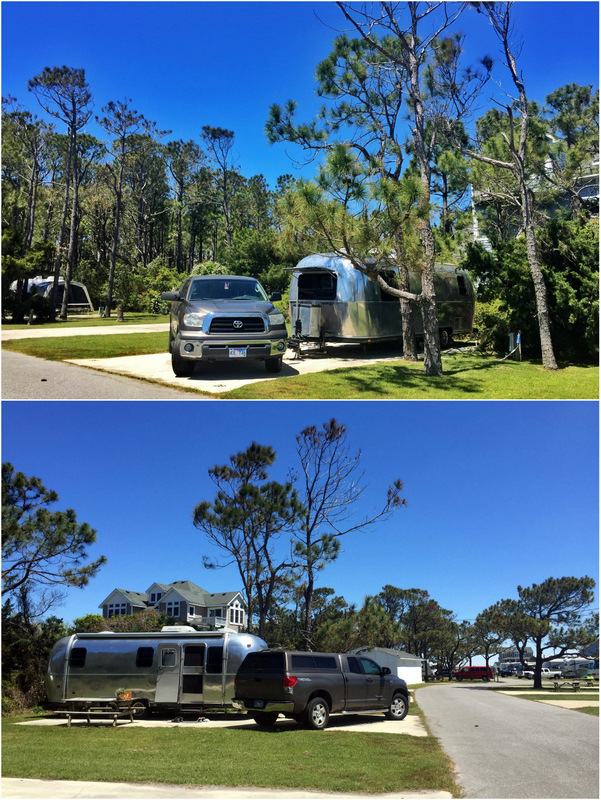 Once on Hatteras Island, we drove north to one of the three Cape Hatteras National Seashore Campgrounds. There are four in total, all offering up dry camping near the shore. 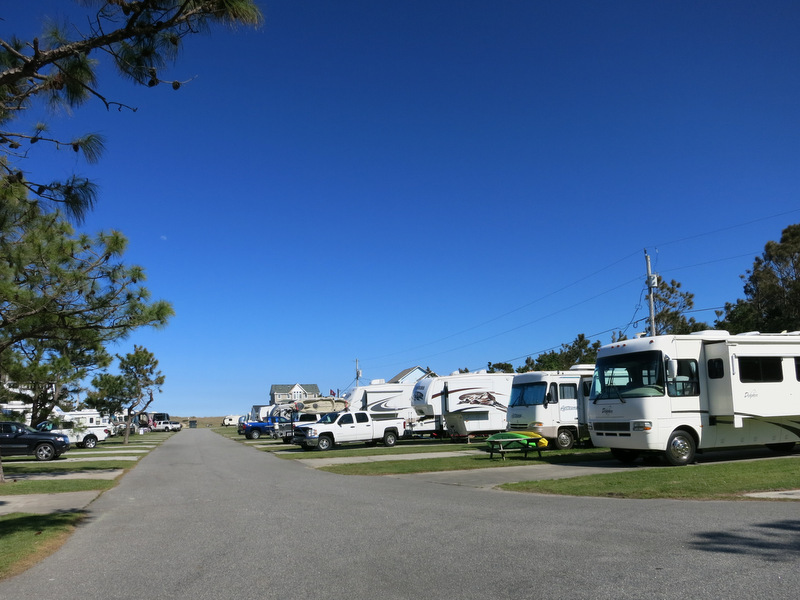 We picked Frisco Campground because it was closest to the Cape Hatteras Lighthouse (actually, the Cape Point CG is closer, but it doesn’t open until the end of May). The campground was only partially full, and we had our choice of sites among the dunes. By this point is was late in the day so we only had time for a quick walk down to the beach. By the time we got there it was too dark for photos, but I did take a picture of all the shells we found. Check out that one in the front! I was beyond excited to spot this giant, perfect shell in the sand. It’s called a Knobbed Whelk, and was once home to a large edible snail. Unfortunately, it started raining that night and continued into the next day, putting a damper on our planned lighthouse tour. 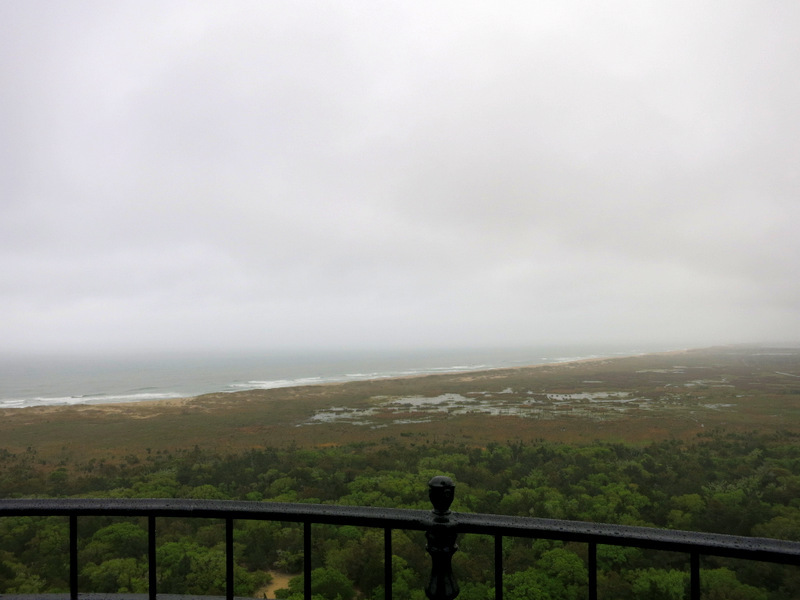 By the time we arrived at the famed Cape Hatteras Lighthouse the drizzle had turned into a steady rain, and the nice gal at the ticket counter told us the visibility at the top was pretty much non-existent. There was no turning back though. Since the lighthouse closes at 4:30 during the week, it was now or never. So we paid our $8 each and began the climb. 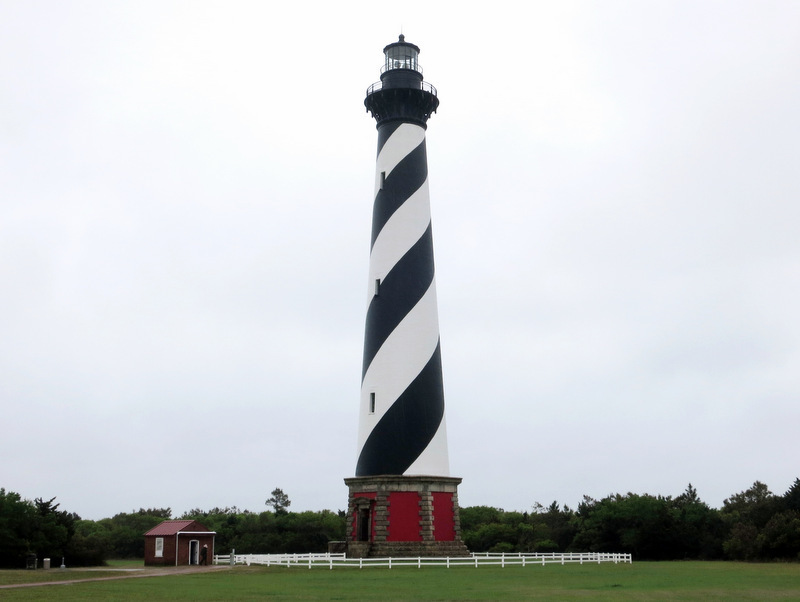 At 209 feet tall, Cape Hatteras is the tallest brick lighthouse in North America. The brick part is important, because while the actual structure is taller than any other lighthouse, the base resides at sea level, making lighthouses built on higher ground taller. Minor details I say. It sure seems like the tallest when you’re climbing all 257 steps to the top. The wind had whipped the rain into a frenzy by the time we reached the top. But that didn’t stop me from stepping out on the balcony to take in the view. Not much to see. They say on a clear day you can see for miles. I’ll have to take their word for it. 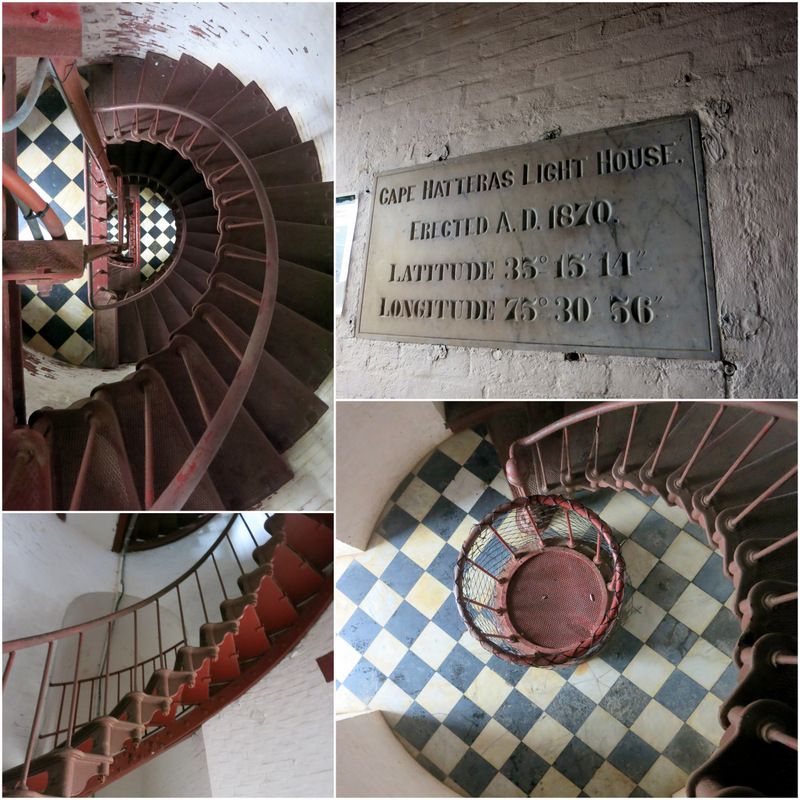 Despite the weather, we enjoyed the lighthouse climb along with our stroll through the adjacent museum. The rain showed no signs of letting up, so we skipped over any other sightseeing in favor of heading straight to the campground. I booked us a site at the Ocean Waves Campground for the week. 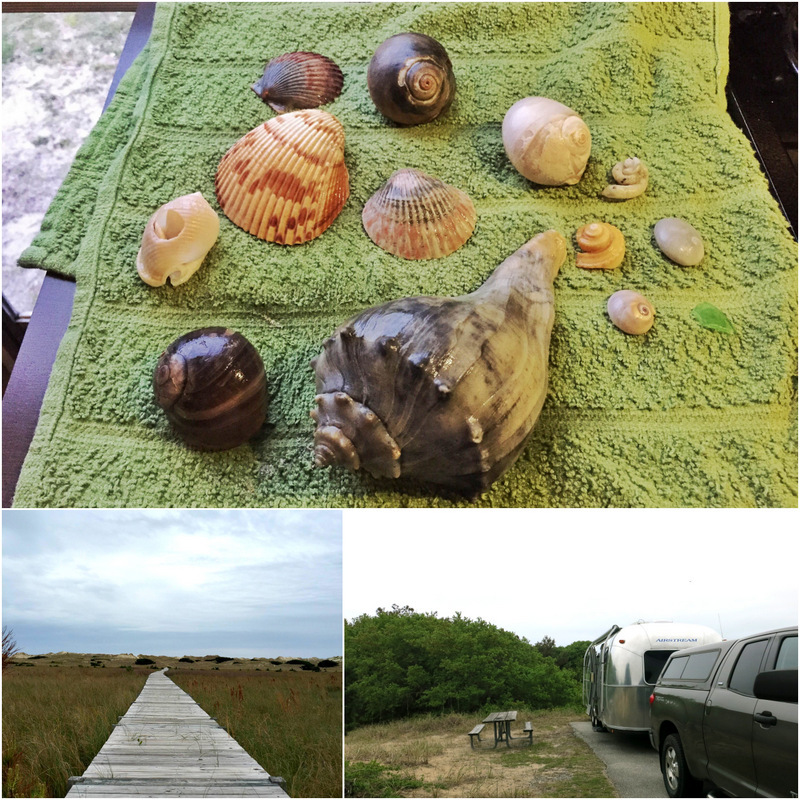 We generally prefer public parks, but I knew the weather was going to be iffy this time of year and thought we might be happier at a private park with some shelter from the wind, rather than at one of the national seashore parks where we would be camped among the dunes. It turned out to be a good choice and we liked the campground more than anticipated. The campground is set up with two distinct sections. The area near the front of the park is a mix of back-in and pull thru sites with large strips of grass between. While the area near the back of the park (closer to the dunes) has sites that are much closer together. For some reason, this area was nearly full, while the section with better spacing was nearly empty. We lucked out with no neighbors on either side for most of the week. It was very quiet and peaceful, but again this is still considered the off season, so I suspect things might be a bit different around here in the middle of the summer. One other note about the campground — if you opt out of the cable and get the weekly rate, it only costs $37 per night. Not bad considering that this week we’re staying at a Virginia State Park with only partial hook-ups for $38/night. We had one of those weeks where we barely left the campground. There really was no need since the main reason for our stay — the beach — was a mere five-minute walk from our site. We lucked out with some gorgeous (yet cold) sunny days during the first half of the week, which we took full advantage of with several long afternoon walks on the beach. That all changed later in the week when the rain and wind rolled in, but as we’ve been in a rainy weather pattern for the last three months, we’ve gotten good at entertaining ourselves inside (work, movies, cooking). Luckily, the sun reappeared just in time for the work week to end, and we spent the first half of the weekend touring the northern part of the Outer Banks. First stop — the Bodie Island Lighthouse. 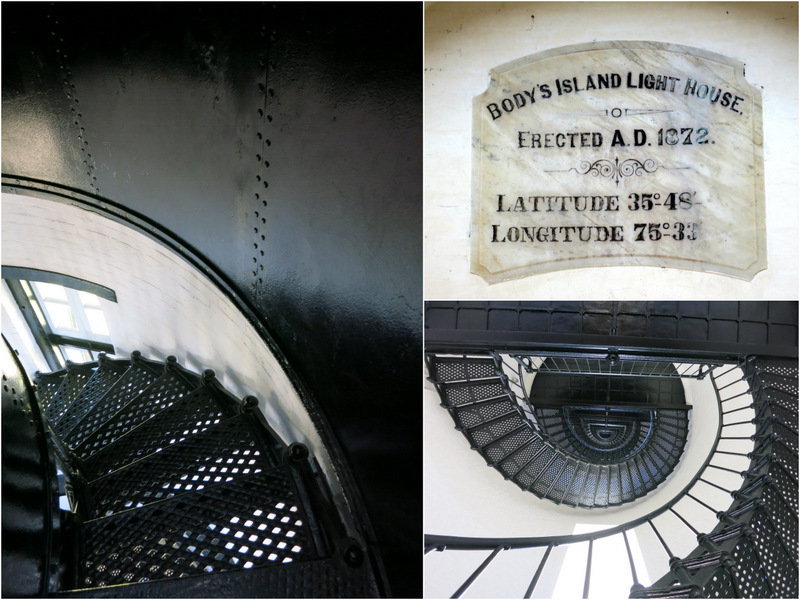 The Bodie Island Lighthouse (pronounced Body) recently underwent a series of renovations that now allow visitors to climb all the way to the top. Measuring in at 156′ tall this lighthouse is not quite as strenuous of a climb as the Cape Hatteras Lighthouse. It is just as gorgeous inside though, with an impressive wrought iron spiral staircase and freshly painted white brick walls. Unfortunately, while the photos make it appear to be a perfect day for lighthouse climbing, it was actually incredibly windy and we were informed upon buying our tickets ($8 each for this one as well) that we wouldn’t be able to go out on the balcony at the top. Bummer. I was able to get this out-the-window photo from one of the windows at the top. Here you can see the surrounding marsh and Atlantic shore. It was also too bad that we couldn’t see the actual light at either of the lighthouses. 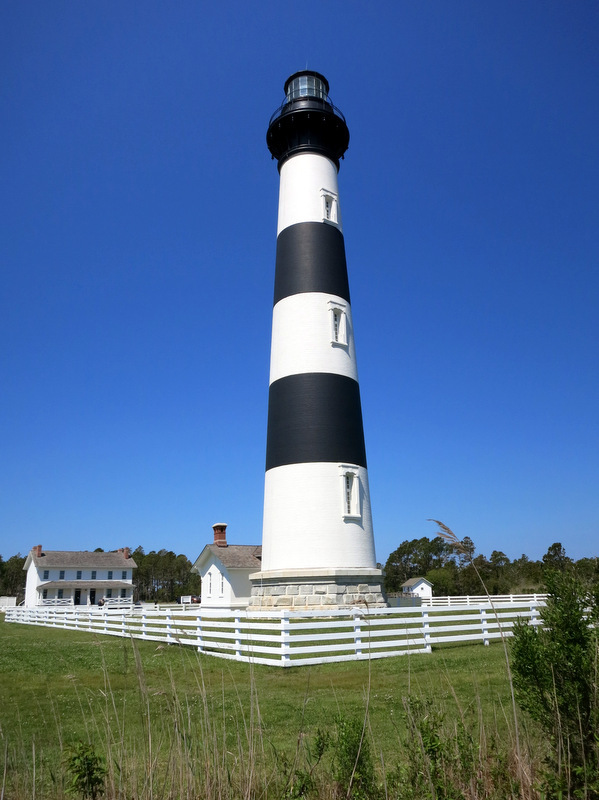 When we toured a few lighthouses in Oregon that was one of the most fascinating parts, and I was a bit disappointed that they were off limits at both Bodie and Hatteras. I did catch a glimpse of powerful Bodie Island light as we drove past on our way back to the campground though. The mighty beam shines 19 miles offshore and makes one full rotation every 27.5 seconds. It’s obvious that both Lighthouses are well cared for by the national park system. While the weather stopped us from having the full experience at either lighthouse, we did enjoy the climb and the learning about the history of the lighthouses. 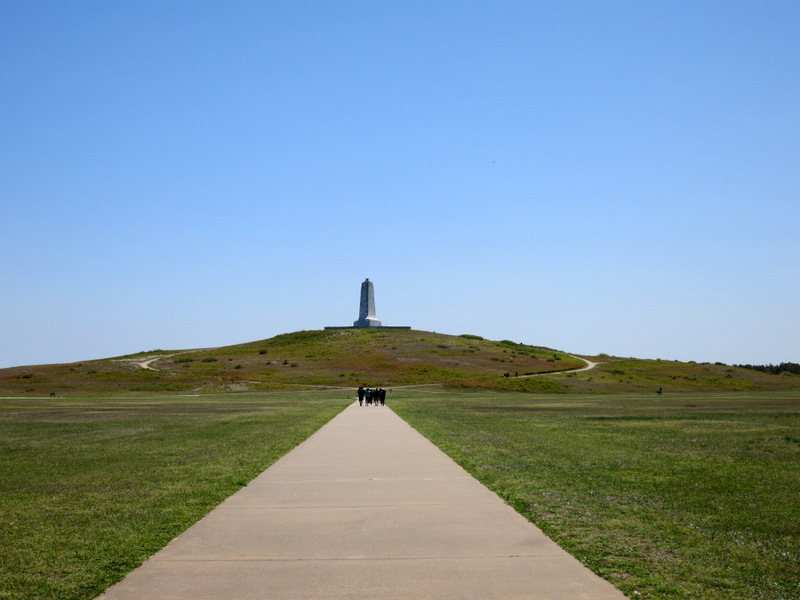 Up next we drove north to see the Wright Brothers National Memorial. 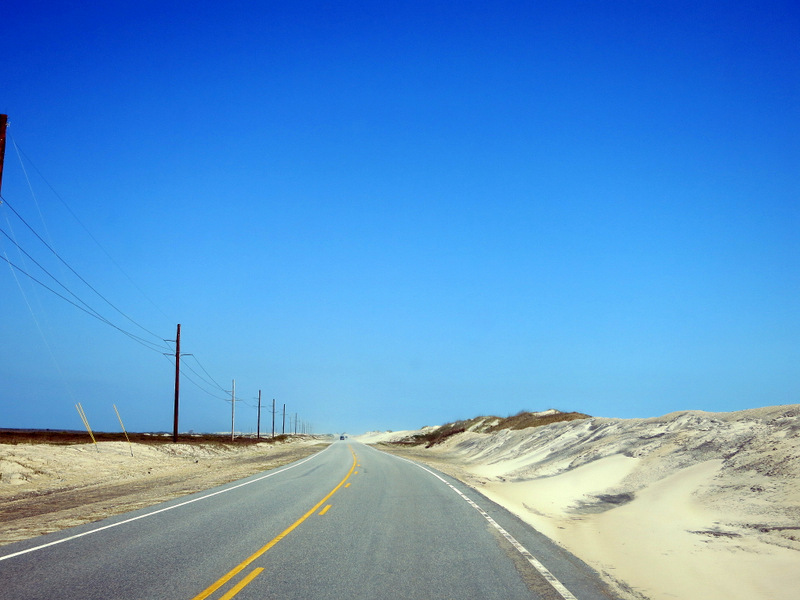 Only a few miles beyond the Bodie Island Lighthouse the national seashore ends and the landscape changes dramatically. Gone are miles of empty dunes, and in their place are miles of tightly packed houses, souvenir shops, and large box stores. It was like entering a whole different world and made us very happy that we decided to stay farther south. 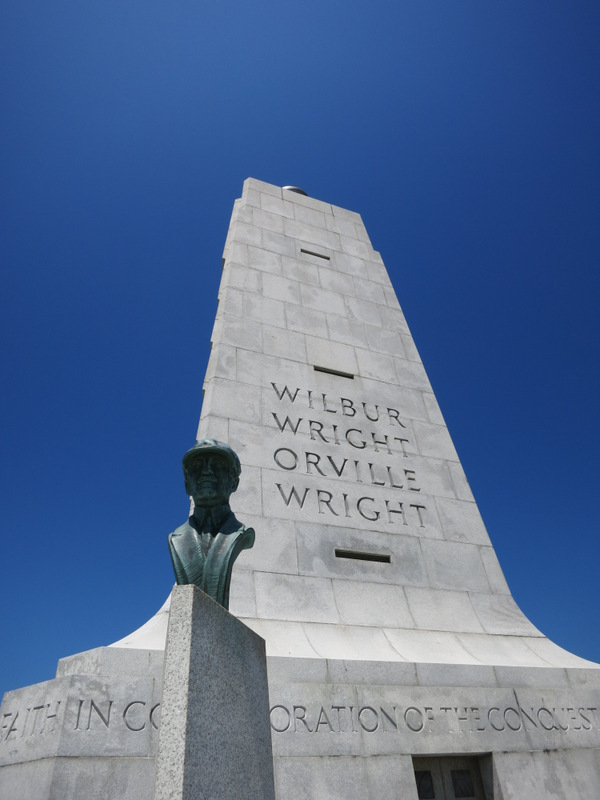 I have to admit that the Wright Brothers National Memorial exceeded my expectations. Here’s the thing. If I was to rate my interest in aviation history on a scale of 1 to 10, it would probably fall somewhere around a 3. So imagine my surprise when the national memorial turned out to be absolutely fascinating. 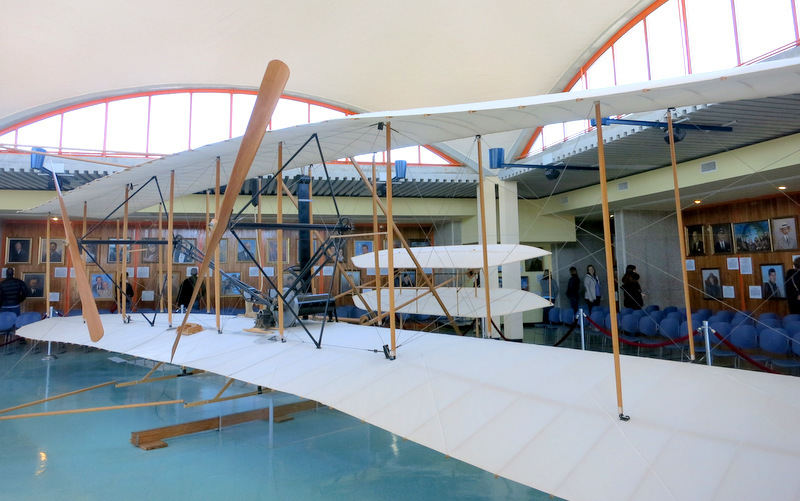 The visitor center featured a series of displays telling the history of the Wright Brothers and their unrelenting quest to build a flying machine. It also housed a full-scale replica of the first airplane to ever take flight. 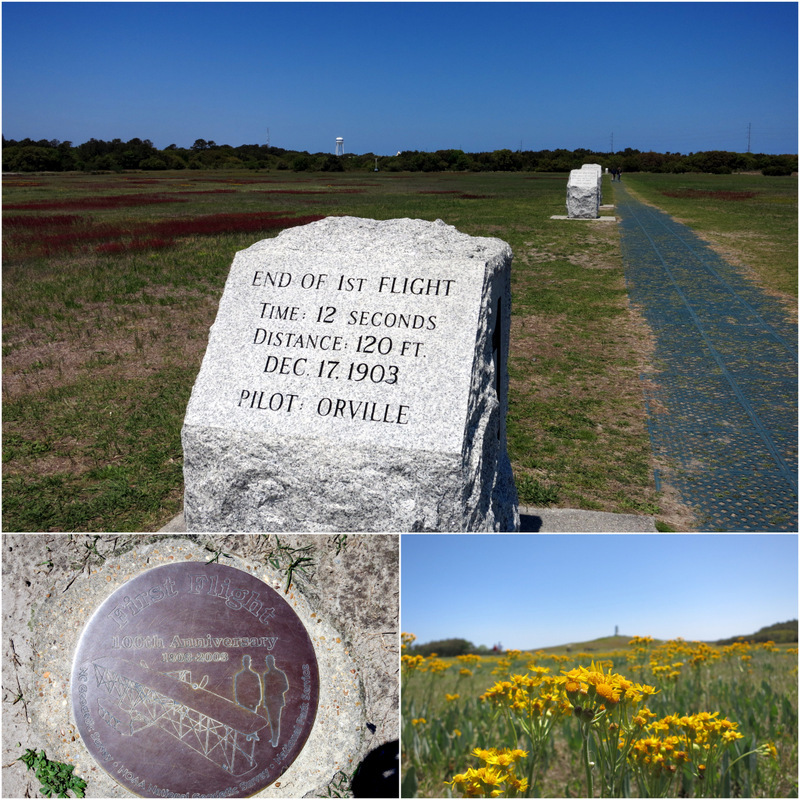 Outside we followed the path past four granite pillars that marked the end of each successful flight. At the top of the hill, we took in the giant memorial and contemplated what it must have been like for the brothers on that blustery day over 100 years ago as they attempted their first flight. After a few hours at the memorial, we briefly considered going farther north to the most northerly lighthouse on the Outer Banks, the Currituck Beach Lighthouse. But from there it would have been an hour and a half drive back to the campground, so we decided to leave it for another time. 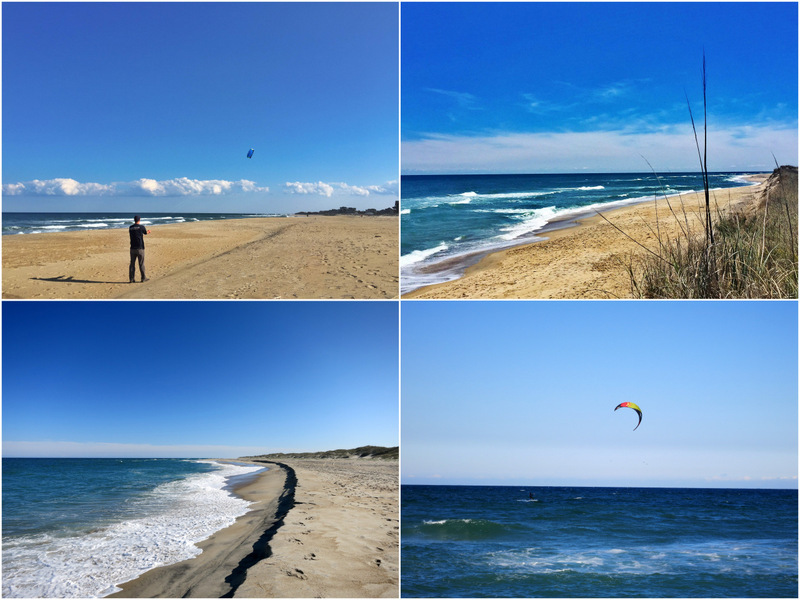 While our stay in the Outer Banks was brief, and the weather not exactly beach bumming material, we both agreed that it was well worth the journey and a place that we would love to return to someday. Devil’s Garden Trail- Arches N.P. If you ever go through Dayton, Ohio, make the trip to the Wright Patterson Air Museum. Wear a sweater, it’s cold in there. Anyway, I’m not as interested in airplanes as my husband is, but I really enjoyed it. The Wright Brother’s memorial was really cool. We liked it, too. You guys are so cool! I wish I was out there following all your adventures. Looks wonderful! I am glad you got a few sunny days to check the area out. Look the dramatic paint on the lighthouses! The Cape Lookout lighthouse farther south has a black and white diamond pattern that I would loved to see! Have to admit I’m a tad jealous of your lighthouse experiences. We’ve yet to see most of the East Coast beauties, and they are oh-so different from our West Coast gals. Great pics! I thought of you as we toured these lighthouses Nina. They are indeed different from the ones on the west coast. Looking forward to seeing more as we continue north. I’m glad you enjoyed the Outer Banks, it is one of my favorite spots. Like you, not crazy about Nags Head but love everything south of Oregon Inlet. We’ve made the trek down to Hatteras Light three times and the lighthouse was in a different spot each time. First, the original spot out by the beach. Second, in the middle of the move in 1999 and third in the present location. We also love going to see the charter boats come in at Oregon Inlet with some huge marlin and tuna. We read about the lighthouse move. Pretty cool that you got to see it in the middle of moving. Very much enjoyed the tour. 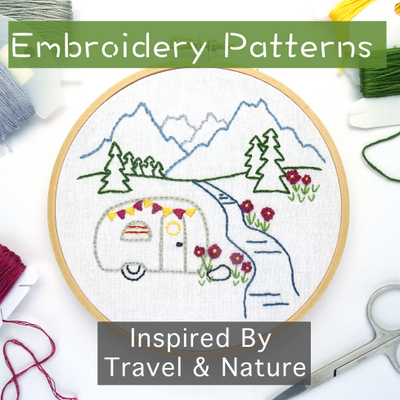 Your commentary and photos made it come alive…thanks for a lovely post. You’re very welcome Rhonda! So happy you enjoyed the post. The Outer Banks are definitely on our radar for next spring, so thanks for the great info. 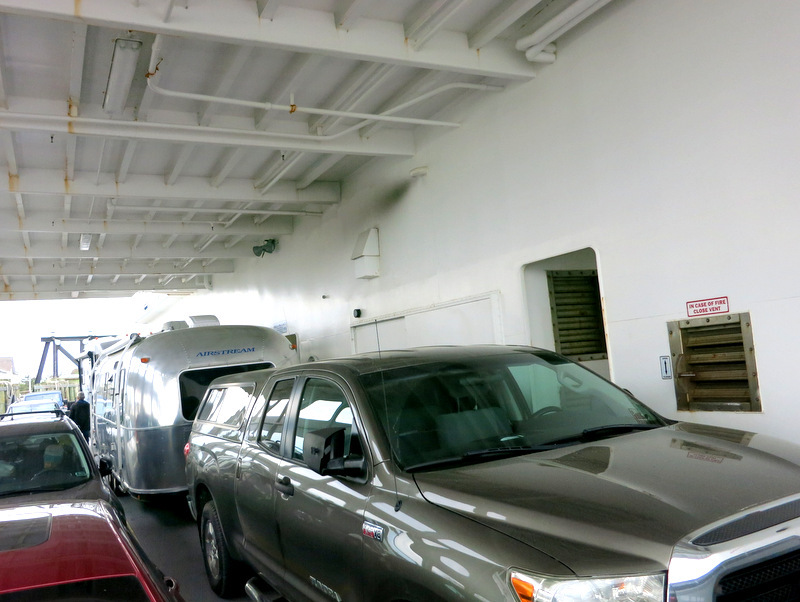 We love ferries, too — there’s something so romantic and adventurous about ferry crossings with our trailer. Based on your weather reports, I’m trying to prepare myself for a very different spring next year than we’ve experienced this year in our travels in Arizona and California. Maybe it will keep me indoors and I can get some work done, haha! Yes, prepare yourself for rain. All the lush green and beautiful flowers we find ourselves surrounded by comes at a price. On the plus side- we’ve both been very productive on the work front! I’ve been following your blog for several months now and have enjoyed the information over the past few months as you traveled through Florida, Georgia and the Carolinas. I’ve been a little envious as we had to cut our journey short through Florida before reaching Georgia and beyond a few weeks back. I will definitely add your destinations to our list of future places to visit. Thanks Anna! Hope you make it farther north someday. The Carolinas in particular are pretty special. What wonderful memories your post conjured up Amanda. I love, love, love the Outer Banks! We spent 19 glorious days there before we started our actual full-time adventure and if I can get Joe back east, I hope to spend more days walking the beach there. It was also during May and the weather was iffy. I am especially happy to see your post because since our visit, 2 huge hurricanes have landed there. Your shells are beautiful! We read a bit about the hurricane damage and you can see areas where they have rebuilt the dunes. I hope you make it back someday. It’s a pretty special place! I felt the same way when we visited Outer Banks a few years ago about the Wright Brothers Museum. I had very little interest in going, but was very surprised at how interesting it turned out to be! Glad you enjoyed your time there – we’ve only visited before we RVed, but we’ve always wanted to return someday. I’m quite envious of your coastal habit, but happy to travel along with your blog and photos. I spent several summers during my college years living and working in Ocean City, MD, and then many more summers hanging out at the beaches of Cape Cod during my twenties. While the Pacific Ocean has its charms, I miss the warm waters and long stretches of beach for walking. We’ve been having fun exploring the Atlantic coast after spending so much time in the Northwest and CA. There is a very different feel to the beaches on this side of the country. While in the west the coast line is dramatic and awe inspiring, over here the beach has a lazy day feel to it. One that invites you to stroll for simply sit and watch for hours. We feel very fortunate that we have been able to experience both.